Every fairy tale deserves a happy ending and this lovely little fairy tale princess is the perfect way to remember this classic. 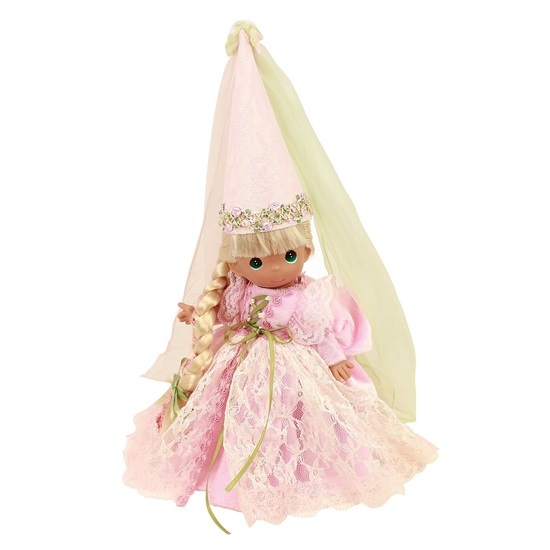 Enchanted Rapunzel is ready to meet her Prince dressed in a pretty pink satin gown with a pink lace overlay. Her blonde rooted hair is french braided with pink trim throughout. She has painted green tear drop eyes and a gracious painted smile. A pink hat with pink and green sheer satin flowing from the top, and pink shoes complete her tale inspired look. She is 9 inches tall and is jointed at her neck, arms, and legs. She is another beautiful creation by Linda Rick and is perfect for ages 14 and up.